• Build a Hartley Oscillator from given instructions. • Test a Hartley Oscillator for correct operation. • Take measurements on a Hartley Oscillator. Build The Hartley Oscillator shown in Fig 2.2.1 using either breadboard (proto board) as shown in Fig. 2.2.2 or on strip board as shown in Fig. 2.2.3,. The frequency of the oscillator can be from around 560kHz to 1.7MHz depending on the value chosen for C3. Full constructional details to build the Hartley oscillator are given below. Test the oscillator by making the measurements described on the Hartley Oscillator Measurements sheet to verify the operation of the oscillator, using a multi-meter and oscilloscope. A really effective way to learn about Hartley oscillators! This Hartley oscillator produces a sine wave output in excess of 12Vpp at an approximate frequency set by the value chosen for C3. Any of the C3 optional values shown below should give reliable oscillation. The circuit will operate from a 9V battery, or a DC power supply of 9 to 12V. Supply current at 9V is around 20 to 30mA. 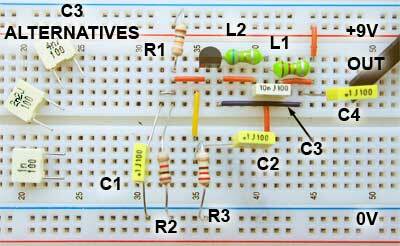 The circuit can be built on breadboard for testing purposes. It may be found that the value of R3 is fairly critical, producing either a large distorted waveform or intermittent low/no output. To find the best value for R3, it could be temporarily replaced by a 470 ohm variable resistor for experimentation to find the value that gives the best wave shape and reliable amplitude. C3 = See C3 Options table. Mark the holes where track cuts are to be made. Double check their correct position before cutting. Solder the wire links in place. Solder the components in place in the following order. Transistor (check for correct e b c positions before soldering). Electrolytic (check for correct polarity before soldering). Terminal Block. (This may be replaced by a 9V battery connector & and an output lead if preferred). Carefully check for any short circuits caused by solder bridging adjacent tracks, and for any poorly soldered joints. Connect up the power supply and connect an oscilloscope to the output. Adjust the 470Ω variable resistor (if used in place of R3) for best wave shape with reliable operation. Once the best position is found, remove the variable resistor and measure its value. It can then be repaced with a fixed resistor having a preferred value closest to the measured value. 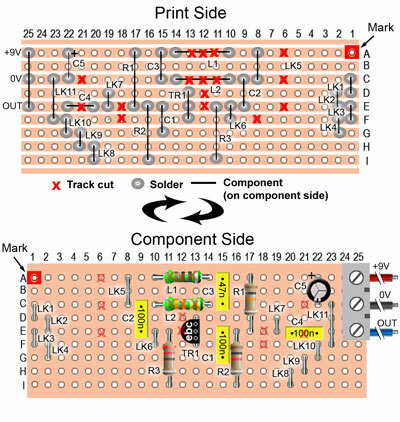 Having built the Hartley oscillator, either on breadboard or strip-board, check that the circuit is oscillating satisfactorily by connecting the circuit to the 9V supply and. connecting an oscilloscope to the output terminals. Ensure the oscillator is producing a sine wave output, and then measure and record the values listed in Tables 1 and 2. Reconnect the oscilloscope to TR1 collector (not the circuit output terminal) and draw at least two cycles of the collector waveform on the grid. Enter the volts/division and time/division settings of the CRO in the spaces provided. From the waveform, calculate and record the values in Table 3.